Updated June 27 at 11:00 a.m. to correct units in several charts. 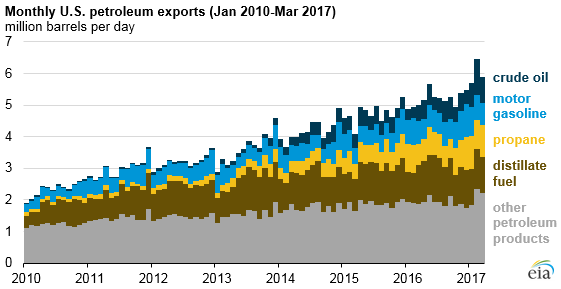 Unlike the recently slowing increases in U.S. exports of crude oil, distillate fuel, and motor gasoline, propane export growth has accelerated. Propane exports are shipped to different destinations than other U.S. petroleum exports. 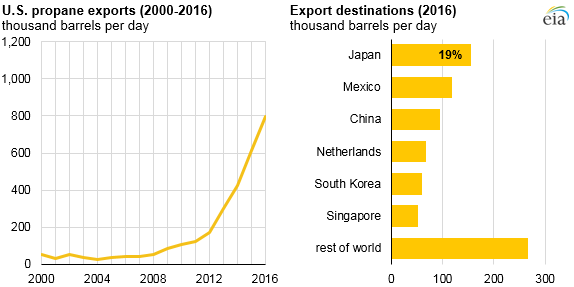 Most other U.S. petroleum exports stay in the Western Hemisphere, but some of the top destinations for U.S. propane exports are Asian countries such as Japan and China. Propane has many non-transportation sector end uses, including as a fuel for heaters and cookstoves and as a feedstock for petrochemical industry.